I don’t really watch a lot of cooking television, but I happened upon an episode of Nigella Lawson’s show where she made this simple cake with lemon drizzle that literally made my mouth water. This recipe has always stuck in my mind, but I never really got around to trying it, until Jules brought home a bag full of lemons that someone gave him. These lemons had an amazing scent and very strong flavor, which made my syrup very pungent and tart and flavorful. I used an almond flour from Trader Joe’s that uses unblanched almonds, so my cake turned out brown (not the lovely yellow of Nigella’s cake on television), but I think if you use the blanched almond flour, the color of the polenta will come through. 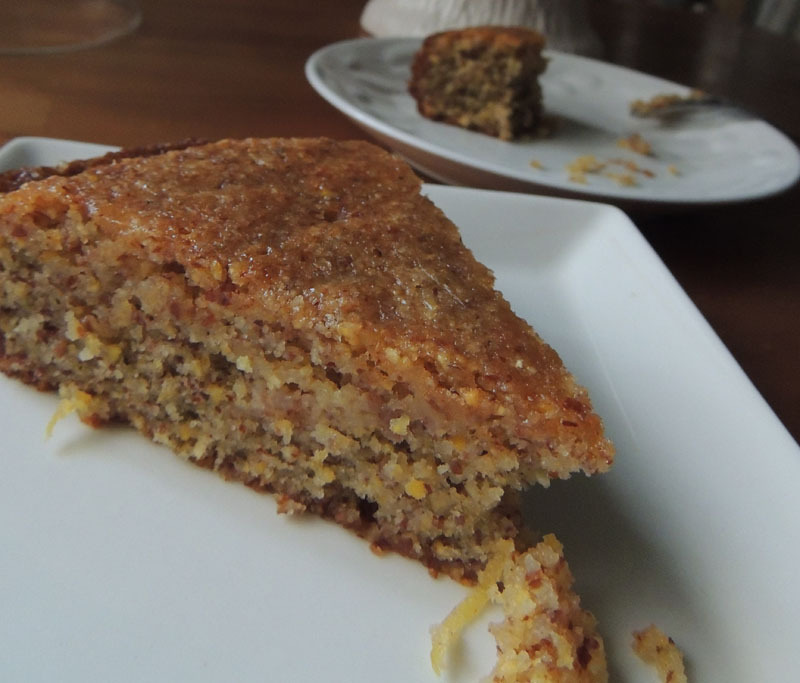 You will notice that the polenta is noticeable in the cake – Jules was skeptical at first of this new texture. Don’t worry, that’s exactly how it’s supposed to be. We ate this cake with nice big mugs of Earl Grey (my favorite), a great contrast against the sweet-tartness of the cake. Line the base of a 23cm/9in springform cake tin with baking parchment and grease its sides lightly with butter. It may seem wobbly but, if the cake is cooked, a cake tester should come out cleanish and, most significantly, the edges of the cake will have begun to shrink away from the sides of the tin. remove from the oven to a wire cooling rack, but leave in its tin.